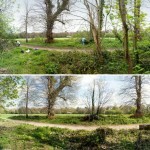 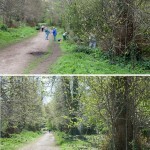 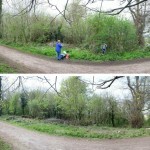 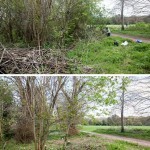 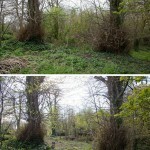 A few photos showing the work our volunteers did at the start of April to push back the encroachment of saplings and undergrowth on the historic trees of the avenue. 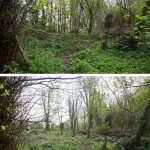 The work was planned to remove a collection of very close-growing ash saplings and open up the understorey for a greater diversity of plants to thrive. 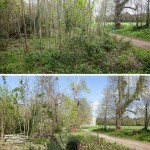 This also improved visibility of the path leading towards the quarry garden, and it’s now much easier to see some of the historic trees beyond the path such as the 400 year old oak; the oldest on the estate. 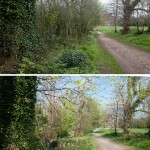 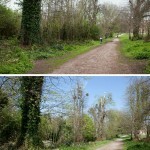 The intention is to replant the three missing lime trees along the line of the avenue some time in the future.